My Grandparents on their Wedding. 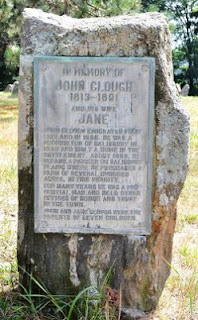 English Origins John Clough of Salisbury, MA was born approx. 1613 in England and is believed to have sailed from London on "The Elizabeth" in 1635. The ship manifest lists a passenger named Jo:Cluffe - 22 (age). I believe that the spelling using the "ff" gives us an idea of how the name Clough was pronounced. It is not known where he was from in England, and it is believed that he came as a servant to another settler. The General Court of Massachusetts granted John Cluffe a lot with his masters consent in March of 1638/9. Salisbury In 1639 John became one of the original proprietors of the new settlement of Salisbury. He was a carpenter and farmer. There seems to have been a second John Clough in Massauchusetts at the same time who was a tailor by trade. John engaged in multiple purchases and sales of land. In 1650 he took the oath of fidelity. He held many town offices including serving on the Grand Jury and acting as town constable. Family His wife Jane/Jone was not listed on the manifest for the Elizabeth and it is unknown when she arrived or when they married. Their first living child was not born until 1642, so it seems unlikely that they were married for more than a year or two at that time. Children of Jane and John Clough Jane and John had at least 8 children. RIP Their eldest daughter Elizabeth's husband was killed in the June 1689 attack of Dover, NH. Many histories have Elizabeth also being killed by she was named in her father's will so that doesn't seem likely. 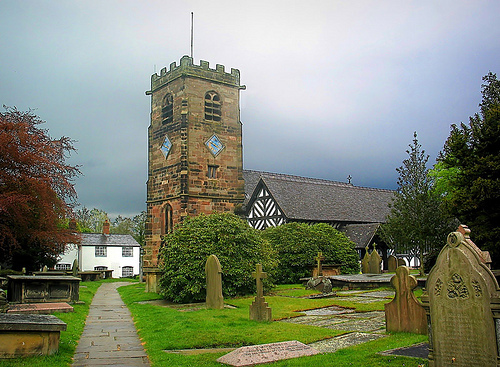 Jane Clough died in 1680 and John remarried in 1686/7 to the twice widowed Martha Cilley. John wrote his will on 3 July 1691, he died on the 26th of July. Their descendants erected a memorial plaque near the area where they are believed to have been buried. This is my great grandparents wedding invitation. I wish I had a wedding portrait. 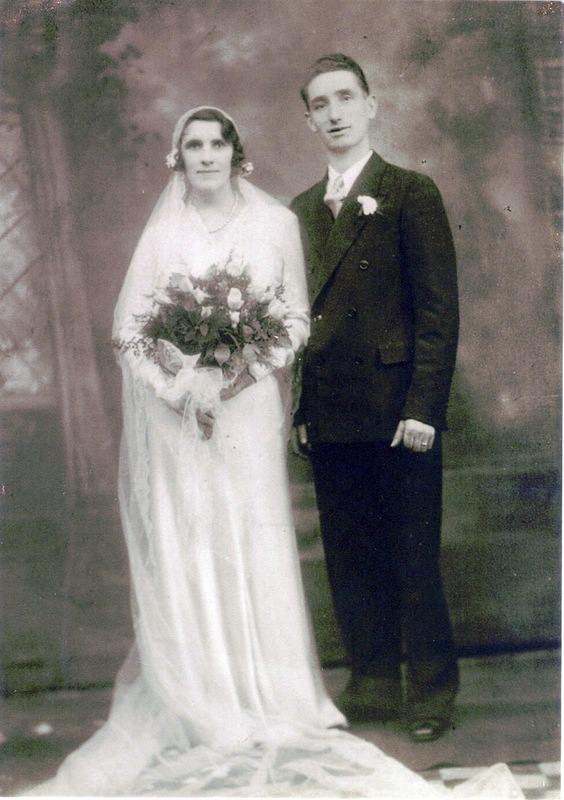 My great grandfather had previously been married, but his wife died only a year later. 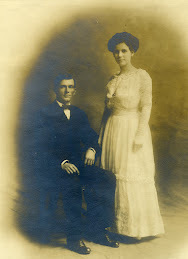 Clover and John were married in 1893, my grandfather was not born until 1899. They had two sons, but the youngest Wayne, died at age 10. Thomas Carter of Salisbury, Massachusetts was born in England around 1610, his origins and parents are unknown. In 1635 he was listed on the manifest for the ship "The Planter" bound for the Massachusetts Bay Colony. He was 25 years old and a servant to man named George Giddings. 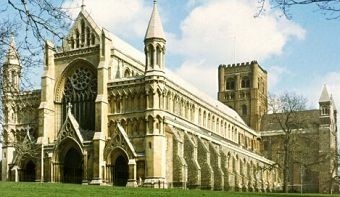 theis underwritten are to be transported to New England, imbarqued in The Planter, Nicolas Frarice, Mr. bound thither, the parties have brought certificates from the Minister of St. Albans, Hertfordshire, and attestecon from the justices of peace according to the Lords order. Those underwritten were George Giddings age 25, his wife Jane age 20, their servants Thomas Carter age 25, Michael Willinson age 30 and Elizabeth Morrison age 12. George, Jane and Thomas settled first in Ipswich. In 1638 Thomas was made a Freeman, which implied church membership, and a release from his indenture. He was granted land in Ipswich that year, but did not stay long. 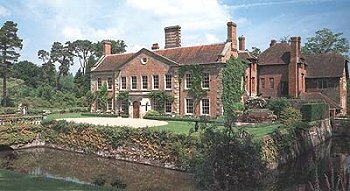 The Giddings family remained in Ipswich and apparently did quite well for themselves. Three Thomas Carters There were three contemporary Thomas Carters, each with a wife named Mary, in Massachusetts and their histories are all mixed up on Ancestry.com, so proceed with caution if you are looking for background on Thomas. This Thomas was not married to either Mary Dalton or Mary Parkhurst, his wife's maiden name remains unknown. 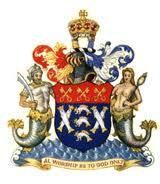 For a bio of Thomas Carter of Woburn see The blog of Heather Wilkinson, Nutfield Genealogy. 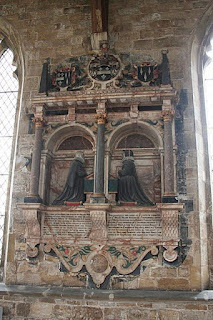 Salisbury Thomas was married by the 1641 birth of his and his wife's first child. They had nine children all told, all who lived to adulthood save one. 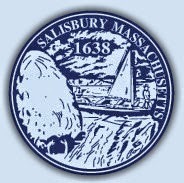 By 1641, Thomas was living in Salisbury, Massachusetts. He was one of the first proprietors of that town. Thomas, unlike some of his neighbors, kept his name out of the courts, so little is known about him. In 1664 he made his mark on the agreement to create the new settlement of Amesbury. He served on the Essex Grand Jury in 1666. RIP His will was written on 30 Oct 1676 and it was proved by 14 November of that same year. He named his wife Mary in his will, so she outlived him. He gave each of his five living daughters 5 pounds and split the rest of his estate between his two living sons, John and Samuel, and his wife Mary. 6. John Carter was born in Salisbury, Massachusetts 18 May 1650. He took the oath of fidelity in 1677. He married by 1681 to Martha Brown of Salisbury, daughter of William Brown. William Brown is most known for his outrageous accusations and testimony against Susanna North Martin who lost her life as a result of his and others testimony during the Salem witch trials. 7. Abigail b. Feb 1652/3 m. Stephen Flanders, Jr. The news of late is full of talk of the current flu season, and how virulent the current edition of the virus is. The local TV news showed reporters questioning people about whether they had had a flu shot, many had but a surprising number had not. This made me think about the David Thornton family who lived in Wheelock, Vermont who suffered a tremendous loss during a flu epidemic in 1859. David Thornton was born in Canada East in 1808. His parents were Samuel and Katherine Baker Thornton, both from Campton, New Hampshire. The Thornton family eventually settled in Wheelock, Vermont. David married Lydia Clark, born in Wheelock, daughter of Dudley and Polly Folsom Clark. 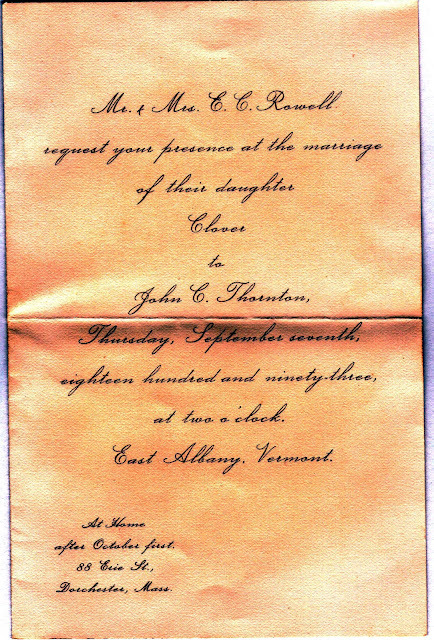 The Clarks were also from Campton, New Hampshire, in fact the marriage occurred in Campton. In the 1850 census, David and Polly as well as her parents lived with their children on the farm. Next door, was David's brother John, who lived with his family including their Samuel and Katherine Thornton. A third brother, Samuel, who was my ancestor, lived in Greensboro, Vermont. Influenza epidemics are nothing new. The worst on record was the 1918 "Spanish Flu" which killed approximately 25,000,000 people worldwide. There was an epidemic in 1793 that seemed to have centered on Vermont, it was a "putrid fever" and influenza which killed over 500 people in 5 counties in four weeks. In 1857-1859 there was a world wide out break of the flu that was described as "extremely severe". There was no flu shot, no Tamiflu, not even a dose of NyQuil to ease the symptoms. 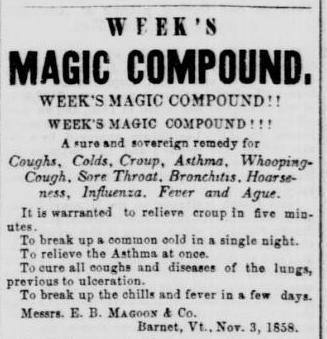 What they did have was a whole lot of quackery like Week's Magic Compound. This ad is from the December 30, 1859 edition of the Burlington Free Press. I guess a desperate person will try anything. On 6 Feb, 1859 eight year old Sumner, 6 year old Adoniram Judson and 3 year old Frank Andrew Thornton died. I cannot fathom the pain that the parents must have felt. A few weeks later on 19 March 1859 Keziah C. Thornton, aged 20 died. I do not know for sure that they died of influenza, but I am sure that they died of some type of infectious disease. In the 1870 census the David Thornton family had left Wheelock and returned to Campton, New Hampshire. David and Lydia's oldest son, John, died in 1873. The remaining children outlived their parents. Adoniram Judson was a Baptist minister from Salem, MA. At first I thought the name was a typo, but apparently he was named for this man. Mabel Risheill and her first husband.